gold, red, green, copper, blue or black. also eat spiders and small insects. poison to kill 10 grown men! 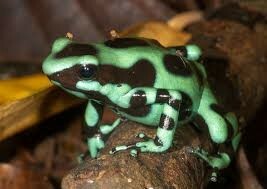 Poison arrow frogs breed at the rainy season. Some dart frogs live in bromeliads. When you get your poisonous pet you might want a tip: Do Not pick him/her up! 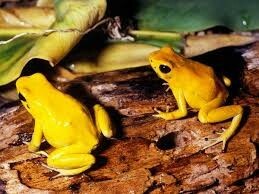 Native people use poison arrow frogs poison for hunting. Poison dart frogs live on the rainforest floor.